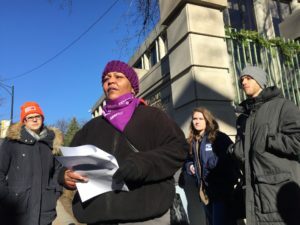 December 6th, 2017: Kim Smith, a Patient Care Tech at Northwestern Memorial Hospital and member of HCII’s executive board, speaks outside of Loyola University in Chicago about the Republican “tax scam” and calls out Gov. Bruce Rauner to oppose the bill. (December 6th, 2017, Chicago, IL) – President Donald Trump’s irresponsible tax “scam” is speeding through Congress. If enacted, Illinois families will lose their healthcare and graduate students would be forced to drop out of college in order to give huge tax cuts to the rich. The GOP tax plan will cause as much as a $1.8 trillion cut to healthcare services – including hospital visits and nursing home care funded through Medicaid – as well as jeopardize the education of over 170,000 graduate students. 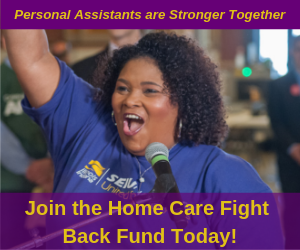 While Illinois families experience deep cuts under the bill, the wealthy will receive enormous tax breaks – including a $300 million cut for Governor Rauner who endorsed the plan days ago. Rep. Peter Roskam voted for a version of the GOP tax plan that passed in November and has been appointed to the conference committee that will work out the details of the final bill. Nursing home worker Lashawnda Dixon dared Rauner and Roskam to explain their support of GOP tax scam at a town hall. Dion knew they couldn’t because the plan robs college education and healthcare from their constituents. Lashanda Dixon, Alden Lincoln Park Nursing Home (read full text). Kim Smith, a patient care tech at Northwestern Memorial Hospital talked about how GOP tax scam steals from her patients on Medicaid while giving $300 million in tax breaks to Governor Rauner. “This ain’t nothing but a robbery,” she said. Graduate students at Loyola joined with healthcare and nursing home leaders to let Congressman Peter Roskam, Governor Rauner and the GOP know that they are paying attention. Jean Clifford, a PhD candidate in philosophy, described how the latest attacks on higher education increases the need for a union for graduate students. On Tuesday, Clifford marched on Capitol Hill with grad students from all over the United States. In describing the action, she said that” [w]e showed up at Speaker Ryan’s office and refused to leave until we spoke with him. Because he would not speak with us, the Capitol Police arrested us. 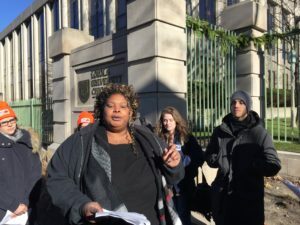 December 6th, 2017: Lashanda Dixon, a nursing home worker at Alden Lincoln Park Nursing, speaks outside of Loyola University in Chicago about the Republican “tax scam” which will slash Medicaid and Medicare funding for working working families and seniors.